With their T-Priv 3 300W Mod and Prince Tank Vape Kit, SMOK have pushed the limits of vaping to new heights! 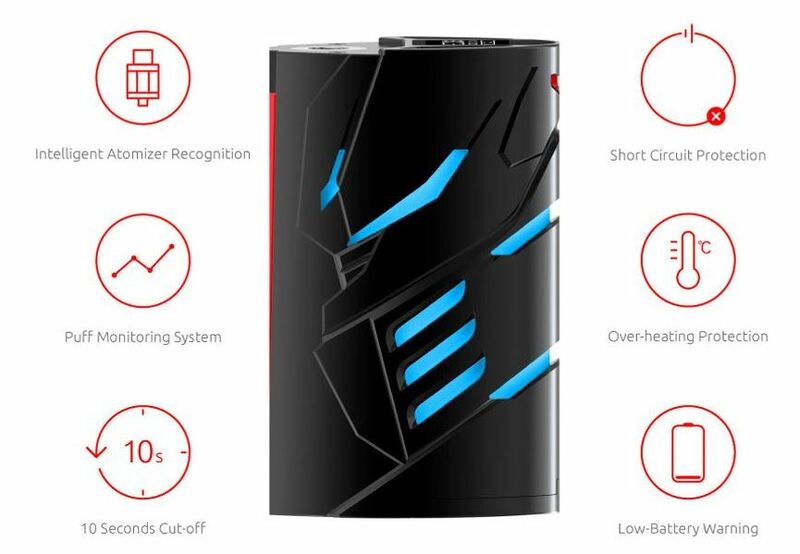 Version 3 of the T-Priv mod comes with expanded capacity, and now uses three 18650 batteries (not supplied) to generate adjustable power levels up to 300 Watts. This ultra high-power mod is packaged with the handsome Prince atomizer – a TPD compliant super-tank that comes with two SMOK V12 multi-core coils. 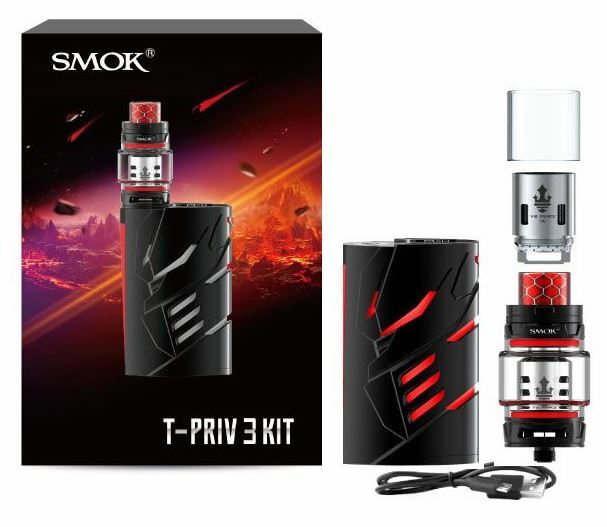 Buy the SMOK T-Priv 3 300W Mod Kit with TFV12 Prince Tank Deal for under £30! Use the code “summer30” to get a 30% off discount code for this product. 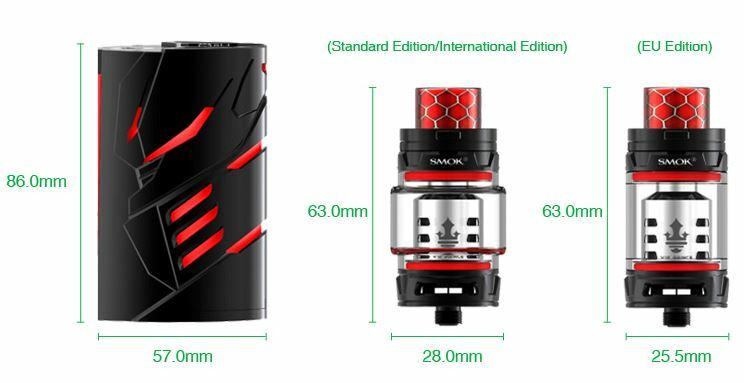 The SMOK T-Priv 3 is powered by three 18650 cells with max 300W power. It adopts the same hollow out design as the original T-Priv but with an ellipsoid body. 9-colour modes customization LED makes your device more attractive. It pairs with an 8ml TFV12 Prince tank with adjustable bottom airflow and top fill system, which brings A wonderful flavour. The SMOK T-Priv 3 returns with auras that emanate powerful charisma and justice. Being a great leader, it has a strong sense of honour to be invincible. 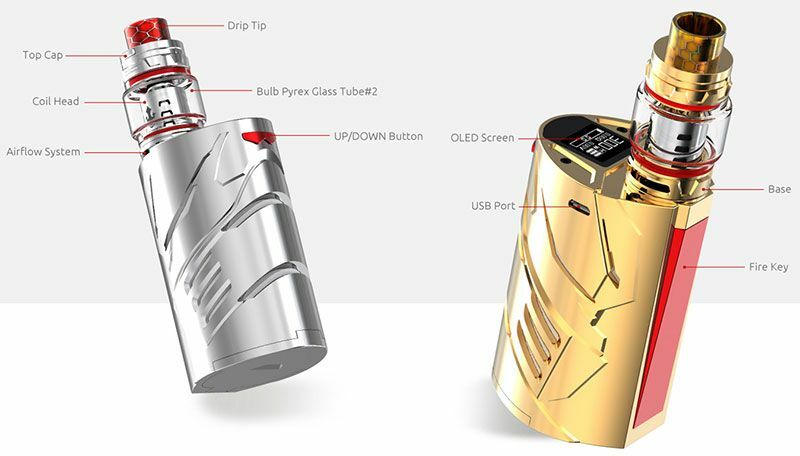 It adopts the same hollow out design as T-Priv mod to show the king’s ambition. From a cube to ellipsoid, T-Priv 3 realizes a perfect deformation process, which becomes more robust and powerful. 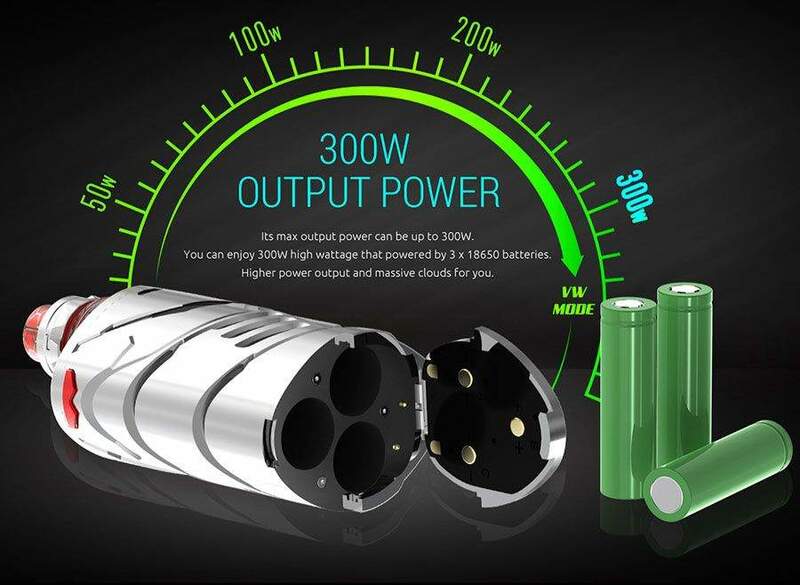 Super 300W output, powered by 3 x 18650 batteries, ensures a carefree vaping experience to your heart’s content. It still uses the revolutionary TFV12 Prince tank with a super large capacity–8ml to continuously bring you a wonderful flavour. Everyone is his own king. Innovation keeps changing the vaping experience! In variable wattage mode, the SMOK T-Priv 3 Box Mod can be cranked up to an incredible 300 watts of power output, making this mighty mod one of the most powerful on the market today. You can set the mod to soft, normal or hard output modes with variable wattage to further customize your experience. If you’re more focused on flavour than cloud size, flip the mod to Temperature Control mode and vape at a precisely controlled heat level that you set between 200 and 600 degrees Fahrenheit. The mode offers support for nickel NI2000, titanium and stainless steel coils and has pre-heat capability for a fast response. An elliptical body gives the SMOK T-Priv 3 Box Mod a sleek, clean silhouette and a comfortable feel in your hand. No sharp edges get in your way of an excellent grip, and the smooth body has just enough friction to prevent slippage. The lateral big fire key is easy to access and has a pleasant clicky feel, enhancing the ergonomic benefits of the vape. The SMOK T-Priv 3 Box Mod features a stylish design with cutouts in its zinc alloy chassis, giving you a view of bright LED lights. You can set the lights to shine in nine colours: cyan, white, rainbow, red, green, blue, yellow, magenta or RGB. Normal, fade and jump lighting modes let you change the look of your vape to suit your mood. You can set the lights to be always on, on only when the screen is on or while vaping. It’s also possible to turn the lights off for a more discreet vaping experience. On the top of the SMOK T-Priv 3 Box Mod is a large OLED screen that is in easy view when you look down at your vape. The screen provides key information like your current mode, your vaping effect and the current voltage and resistance values. Three separate battery life indicators let you monitor the performance of each power cell independently. For your safety, the SMOK T-Priv 3 Box Mod features a number of protections. The box mod automatically recognizes your atomizer and coil and tailors performance to suit whatever is loaded. A puff monitoring system also adapts performance to how you draw, and the mod shuts off after 10 seconds of draw time to avoid over-firing. Short circuit and overheat protections safeguard your vape. With the included USB cable, you can connect the SMOK T-Priv 3 Box Mod to your computer periodically in order to download the latest firmware. 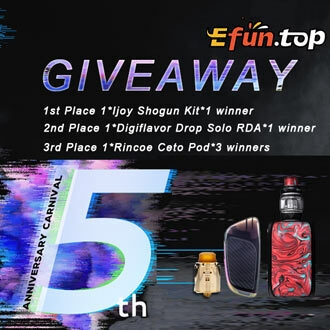 This ensures that you can continue to benefit from the latest technologies that SMOK has to offer. Equipped with an innovative Cobra drip tip, the SMOK TFV12 Prince Tank provides an incredible amount of airflow. Turn the ring on the bottom of the atomizer to increase or decrease the airflow and enjoy a truly customized experience. A leak-proof top slot simplifies filling and eliminates messes. Able to hold 8 millilitres of e-juice, the sizable tank reduces the need for frequent filling.